Gently used. Excellent condition. Minor signs of wear. Slight smudges on screen and body (see photos). Lense is perfectly clean. Always carefully handled. 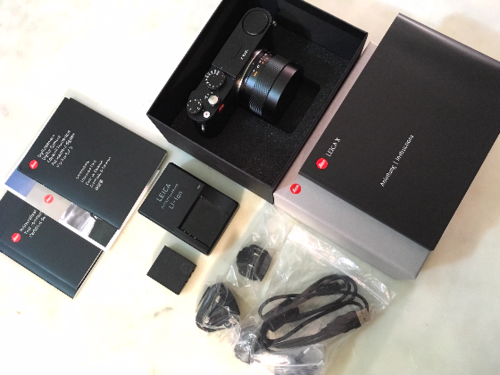 Includes all shown accessories (Leica box, manuals, battery, charger, plugs, cable PLUS third-party extras such as a camera case, extra batteries, and charger). Thanks for looking. 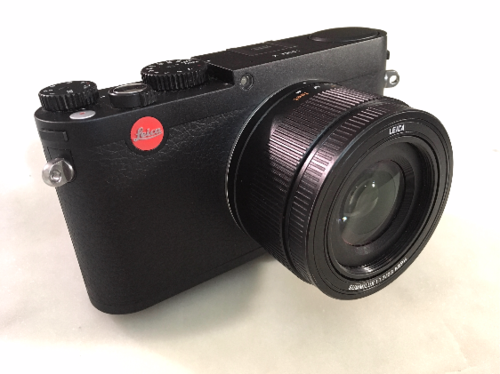 Embracing high quality imaging and compact forms, Leica's X (Typ 113) Digital Camera packs in a large 16.2MP APS-C CMOS sensor and marries it to a Summilux 23mm f/1.7 ASPH. 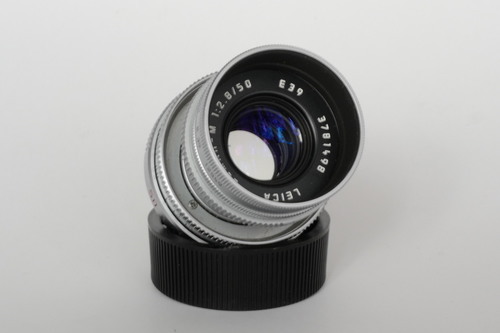 Lens that will provide users with spectacular images and an equivalent field of view to the iconic 35mm frame. The camera also shows off Leica's brilliant Made in Germany design with a sleek black body with a brown leatherette trim. Furthering the camera's capabilities is a physical control ring located on the lens barrel, offering tactile manual focusing during shooting. 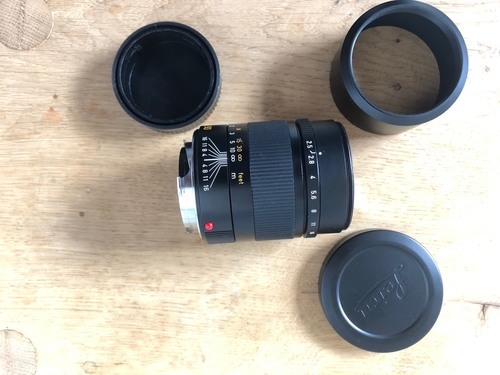 The wide f/1.7 aperture then adds more creative possibilities by allowing photographer's to take control of their depth-of-field and take in more light for low-light shooting. Merging a variety of different technologies, this camera is able to capture remarkable stills at up to 5 fps in the raw DNG file format as well as Full HD 1080p video at up to 20 fps. On top of this, it can utilize sensitivities of up to ISO 12500 for sharp, clear photos in less-than-ideal lighting conditions. 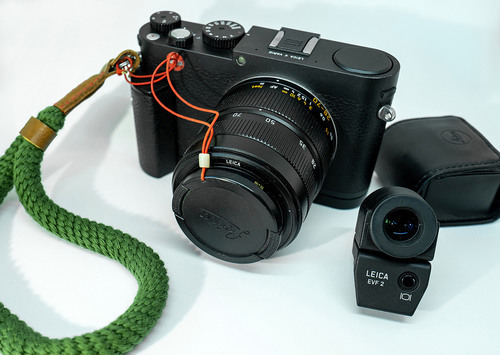 In addition to manual focus, this camera does come equipped with an 11-point AF system that will quickly and accurately lock onto your subjects. Composing and reviewing images is done via the rear 3.0" 920k-dot TFT LCD screen. This display has a wide viewing angle and 100% coverage so shooters will know exactly what they are going to capture and will not be misled when shooting at angles. Users can also pick up an optional optical or electronic viewfinder to further their comfort during use. The camera records images and video to an SD, SDHC, or SDXC card. Also, the compact lightweight magnesium and aluminum body is reminiscent of their classic M rangefinders. Taking cutting-edge digital design and merging it with art, Leica has teamed up with Italian fashion label Moncler to produce a truly stunning version of the Leica X (Typ 133) that embraces the design firm's French heritage and melds perfectly with Leica's precise German engineering. The brilliant design and imaging capabilities make this special edition a perfect partner for the fashion-conscious and photography minded. Only 1,500 of these cameras have been produced, each with a matching case and padded white pouch that emulate the look of Moncler's world-famous down jackets. And, the included leather carrying strap bears a "Leica & Moncler" inscription. 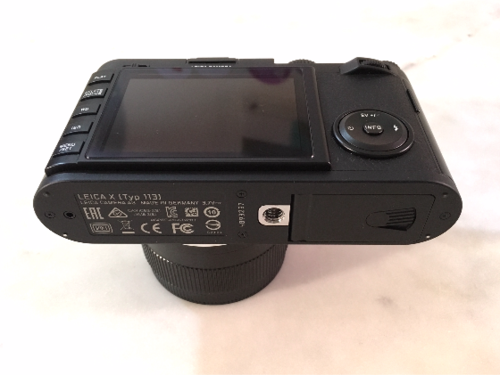 Packing in a larger 16.2MP APS-C CMOS sensor into a compact point-and-shoot body, the Leica X is able to balanced excellent image quality with sensitivities up to ISO 12500 and portability. The size of the sensor will create sharp, highly detailed imagery and allow users to capture images with shallow depth-of-field. 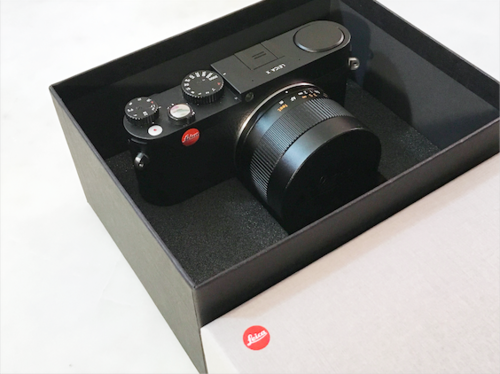 Providing photographers with the perspective of an iconic 35mm lens with the APS-C sensor, the fixed Leica Summilux 23mm f/1.7 ASPH. 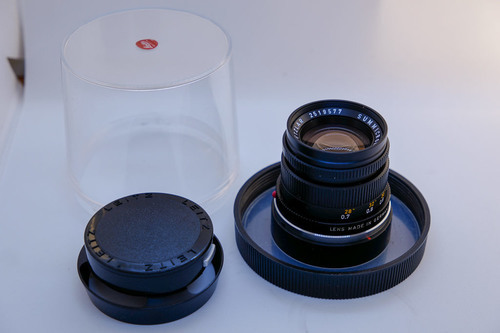 Lens will appeal to many with its outstanding quality and fast f/1.7 maximum aperture. This lens also features a physical focusing ring for exacting control during manual focus and can focus as close as 7.9". The lens is also optimized to minimize aberrations with a 10 element in 8 group design that incorporates two aspherical elements. 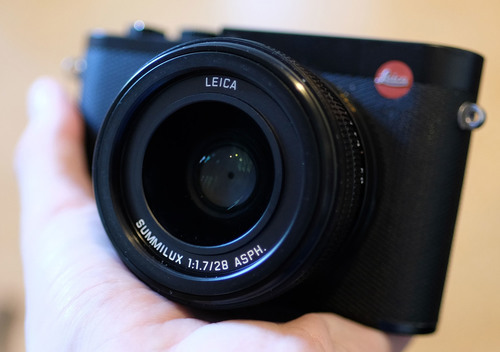 Autofocus and continuous shooting greatly benefit from the speedy processing of the Leica X (Typ 113). Up to 11 AF points are available for rapidly locking onto your subjects and the camera can shoot continuously at speeds up to 5 fps for 7 frames. In addition to brilliant stills, the Leica X (Typ 113) can record full HD videos at 1920 x 1080p at 30 fps. Audio recorded via the internal mic benefits from an integrated wind-cut filter to ensure clarity. Videos can be saved in the Internet-friendly MP4 format and uploaded directly to mobile devices or social media sites without conversion. Additionally, users will be able to watch their creations on a larger screen via the built-in HDMI-out connection. Used for composition and image review, the 3.0" 920k-dot TFT LCD located on the rear of the camera offers bright, vivid colors with a wide viewing angle for clear images from all sides. This interface also provides 100% coverage, so you will always know exactly what you are going to get. Maximize your post-processing capabilities by recording in the raw DNG file format, which provides increased data and latitude for pushing images later on. This also allows users to dial in color without relying on previously compressed data and ensuring that they are delivering the best image possible. 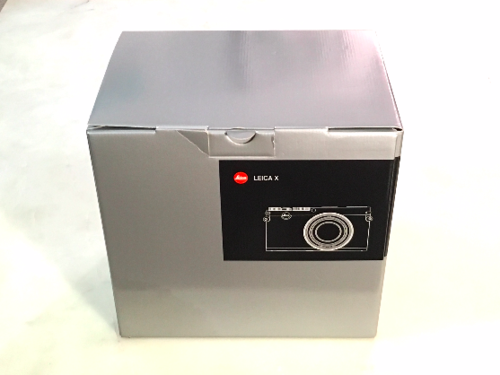 Made in Germany with an aluminum and magnesium design, this sleek camera offers the durability and beauty expected from Leica's long legacy of camera design. 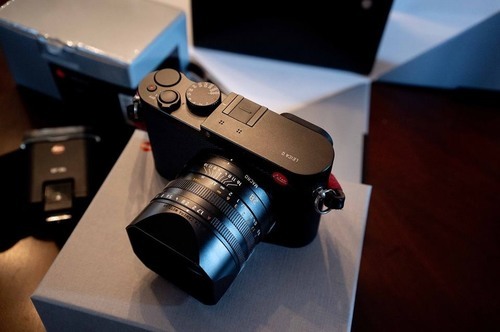 The Leica X (Typ 113) is lightweight and compact while still utilizing a large APS-C sized sensor and 23mm f/1.7 lens allowing users to always have high quality imaging capabilities by their side. Also, it has a leatherette grip that allows for comfortable, secure handling of the camera. Color settings Standard, Dynamic, Natural, B&W Natural, and B&W High Contrast are available for creating ready-to-go JPEG files for sharing and viewing. Manual exposure control is available along with full auto and aperture priority so everyone from beginners to experienced professionals can get started shooting. A built-in flash and hot shoe are available for adding some light to your scene. Exposure compensation from -3 to +3 in 1/3 stop increments. Optional optical and electronic viewfinders are available for more natural viewing. Records images to SD, SDHC, and SDXC memory cards. Previous Advert Leica X Vario ! VERKAUFT / SOLD ! PENDING X Vario mit Aufstecksucher, Handgriff ecc.